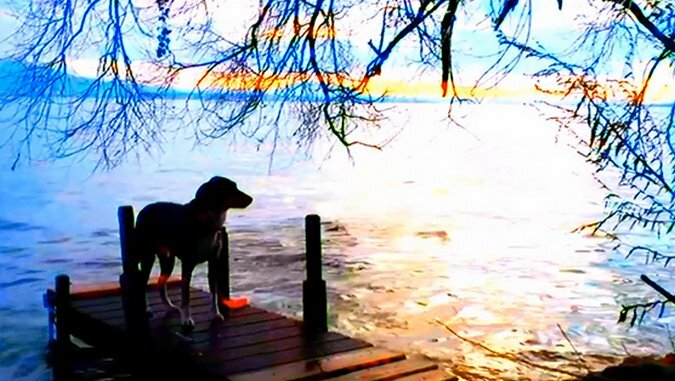 Jean-Luc Godard has made his new film, Goodbye to Language, in much the same spirit as Tar? Gomi’s seminal children’s book Everyone Poops: no matter what differences may set us apart from one another, we’re all united through our undeniable human need to defecate. It’s the greatest of equalizers. This, of course, suggests that any such spirit can be coaxed out of the film in just one screening. Woven sporadically throughout Godard’s visual essay are moments in which his quartet of protagonists talk philosophy on the john, the thunder of their bowel-voiding peppering conversation with the sounds of intestinal exertion. Coming from any other director, these sequences might stretch our willingness to offer our continued patience, but anyone who signs on for a modern Godard flick should probably have an idea of what they’re getting into. This holds true for Goodbye to Language as much as it does for, say, 2010’s Film Socialisme or 2004’s Notre Musique—though the latter films are downright coherent by comparison. It’s dense. It’s opaque. Goodbye to Language is crafted in a way that aggressively defies immediate understanding, really allowing only mitotic absorption; though it clocks in at 70 minutes, it feels like it’s twice as long. As a topper, Godard and his cinematographer Fabrice Aragno shot the whole damn thing in 3D. Coats, branches and many sundry objects poke out at us from the screen while the colors—oh, the colors!—practically vibrate with intrusive urgency. The toilet humor is almost a palette cleanser for his movie’s experimental qualities—which is a sentence I stand wholeheartedly behind. But these aren’t complaints; they’re the exact reason that the movie is such a joy to behold. So what does it all mean? What’s the ultimate point? Godard has a lot on his mind, as evinced by the sheer volume he’s jammed into Goodbye to Language’s sinewy frame. In that regard, maybe there doesn’t have to be a point, because the point, perhaps, is just to rifle through Godard’s brain-library and glimpse if only briefly what it’s like for him to live within that overstimulated architecture. (Think Being John Malkovich by way of Man With a Movie Camera, but 100% more French and approximately just as delightfully elusive.) That explains, if not justifies, the film’s sheer breadth of referentialism, which includes archival footage clips alongside nods to Fritz Lang, Alexandre Aja, Jean Cocteau, Samuel Beckett, Fyodor Dostoevsky, Mary Shelley, Lord Byron, Jean-Paul Sartre and, perhaps unsurprisingly, Godard himself. These materials, which Godard weaves together with a young man’s brio, aren’t a sendoff for language but rather a send-up: They wryly blur the line between truth and fiction, reality and fantasy. Maybe language keeps us at arm’s length from nature, but if so, it still does a pretty solid job of articulating the full gamut of human emotion. Put in short, the film is chaos, but glorious, wondrous chaos that lets us see what genius looks like from the inside. There are through lines that can be read out of the film, of course—in particular recurring laments about the information age and the advent of technology couch Godard’s use of 3D, which alternately disrupts and enhances the conveyance of his images’ meaning. Even as it becomes easier for us to communicate, communication seems to be a dying art. Godard’s characters talk a lot, but they don’t really seem to be going anywhere despite their near-constant back and forth. Whatever topics he explores, though, he does so with tongue firmly in cheek. It’s not just the scenes shot on the crapper that are so innately funny, either, but in his self-deprecating depiction of arthouse cinema and in the way he proclaims language’s failure by making a movie with so much to say that fully unpacking it one sitting feels nigh-impossible. By consequence, Goodbye to Language demands to be seen again, and again, and again, if not for Godard’s sly badinage then for the ingenuity of his craft. And if you still don’t get it after all that, well, just recall Gomi’s words of wisdom. Boston-based critic Andy Crump has been writing about film for the web since 2009, and has been scribbling for Paste Magazine since 2013. He also contributes to Screen Rant, Movie Mezzanine and Badass Digest. You can follow him on Twitter. Currently he has given up on shaving.